The College of Medical Laboratory Technologists of Ontario (CMLTO) is the regulatory body for medical laboratory technologists (MLTs) in Ontario. The mandate of the CMLTO is to regulate MLTs in the public interest and ensure that the public is protected. One of the ways the CMLTO achieves its mandate of public protection is through a formal process to handle complaints. The CMLTO Standards of Practice outline the professional expectations for members. If you are concerned that the care you received from an MLT did not meet the standards, you have a right to complain to the CMLTO. 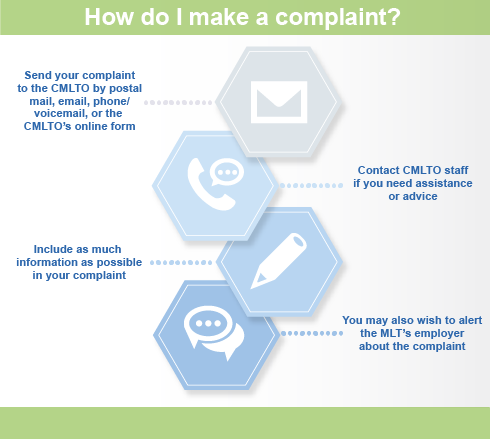 If you are unsure of whether a complaint is warranted, please contact the CMLTO’s Registrar & CEO or the Director, Professional Conduct, who will be happy to answer your questions regarding the practice of medical laboratory technology and the complaints process. 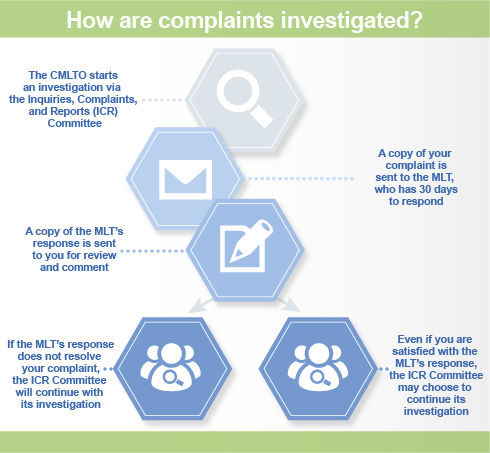 Send your complaint to the CMLTO by mail, video or tape recording, or e-mail. You may wish to use the online complaint form. You may also wish to alert the MLT’s employer about the complaint. Once your complaint has been received, the CMLTO will open a file, send you an acknowledgment, and start an investigation. A copy of your complaint is sent to the MLT, who will be given 30 days to respond to your concerns. The MLT has a duty to cooperate fully with the investigation. A copy of the MLT’s response will then be sent to you for your review and comment. The MLT’s explanation may be enough to answer your questions and resolve your complaint. 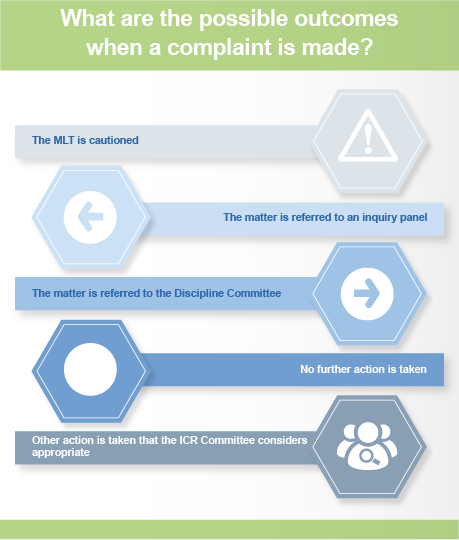 If the MLT’s response does not resolve your complaint, the ICR Committee will continue with its investigation. In some cases, the CMLTO may ask you to sign a consent form to assist us in obtaining records. Even if you are satisfied with the MLT’s response, the ICR Committee may choose to continue its investigation if it feels that it is in the public interest to do so. The CMLTO will keep you informed. The ICR Committee may decide to appoint an investigator to gather more information relating to your complaint. This may include interviewing you, the MLT, and anyone else who may have information relating to your complaint. All personal information relating to the investigation and resolution of a complaint is held confidential by the ICR Committee. Require the MLT to appear before the Committee to be cautioned. Refer the matter to an Inquiry Panel for action if there are concerns that the MLT may be suffering from a physical or mental incapacity. Refer the matter to the Discipline Committee, which deals with allegations of professional misconduct or incompetence through a formal hearing. The discipline process is entirely separate from the complaints process. As the complainant, you are not a party to the Discipline Committee proceedings. However, you may be called to appear as a witness. Take other action it considers appropriate, consistent with the Regulated Health Professions Act, 1991 (RHPA), which may include requiring an MLT to complete a specified continuing education or remediation program. Note that the CMLTO does not have the authority to demand funds from the MLT or to assess damages in any way. This can only be achieved through the civil court system. The decision of the ICR Committee, along with written reasons, will be provided to you and the MLT. What happens if I am not satisfied with the decision of the Inquiries, Complaints and Reports Committee? Is there an appeal process? Unless the decision has been to refer the matter to an Inquiry Panel or Discipline Committee, both you and the MLT have the right to request a review of the decision by the Health Professions Appeal and Review Board (HPARB) . HPARB is an independent body established by the provincial government. It is made up of non-health care professionals. 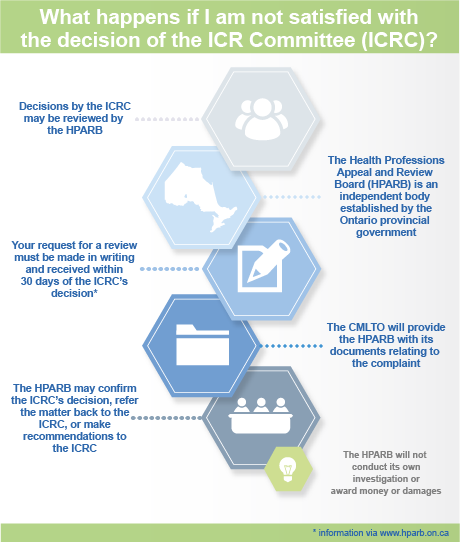 A request for a review must be made within 30 days of receipt of the ICR Committee’s decision. HPARB reviews are open to the public. Why is the process so formal? The CMLTO, like all other regulatory health Colleges, is governed by the procedures set out in the Regulated Health Professions Act, 1991. In order to ensure fairness, the members of the ICR Committee and the CMLTO staff who support their work are required to adhere closely to standard procedures and must remain objective and neutral throughout the process. How do I contact the CMLTO? CMLTO French language services policy/Services en français (English PDF) (French PDF). Get informed about patient-practitioner boundaries with the following articles.